This one goes out to all the Steely Dan freaks, nerds and weirdos out there — you know who you are, and to the haters as well (you, too, know who you are). My friend and fellow Dan advocate, T. Law, put this comp together about nine years ago when we were both knee-deep in our excitement over the release of Fagen and Becker’s first studio LP in 20 years, Two Against Nature (preceded by 1980’s Gaucho). Consisting of live, radio/tv sessions, the disc served as a bit of a primer for seeing the Dan live, for the first time, in the summer of 2000. So, here is my question: In the ’00s, who is our Steely Dan? Is there one? By the way, this is not a query aimed at those only familiar with their classic rock radio “hits,” nor those with some sort of misplaced ironic appreciation. As a long time Dan fan, I salute you for this! In the ’00s, who is our Steely Dan? Is there one? This is beautiful. Please also reload the Gaucho outtakes!!! I hate to admit liking Steely Dan (ok, if it’s not shameful to like Boz Scaggs, then it’s not shameful to like Steely Dan), but their music has an incredibly distinct feeling (they are indeed the pioneers of jazz-rock – everyone who attempted jazz-rock post-Dan was either delusional or incredibly lame) that makes it impossible to dislike (in certain aspects). When I still had Aja on my iPod it was one of my most listened-to albums. Accolades to Steely Dan, and a repost of the Gaucho outtakes would be phenomenal (my incessant rambling makes evident my inner music writer – wish I was one). I love the Dan and would love to admit it. Killer mix, I’m just getting deeper and this is perfect timing. Wish I could help out on the Steely-Dans-of-today question. I take it back- I am NOT afraid to admit I love Steely Dan. Sounds like a title for a Yo La Tengo album. Untitled instrumental = Your Gold Teeth II (sans vocals). not ashamed to love the Dan. What about the Beta Band? @ es, thx for the remider – i forgot to change the titles form the cd rip. Steely Dan is the Steely Dan of the 00’s. Ween is great too! When Aja came out I was too young to appreciate them. Later on in High School, my girlfriend played me their earlier albums and I was hooked. I considered them up there with Zappa, Dylan and the Beatles in terms of songwriting muscle. However, back when Goucho came out, Rolling Stone gave it one star, and I have to agree. Goucho turned so people off of Steely Dan, it hurt their reputation for years to come. Thank God for Two Against Nature — which ranks as one of their best. When I first heard Jack of Speed, I thought, yes, they’re back! Thanks for posting these tracks! Long live the Dan. I never seemed to be sold on Gaucho (similar to comment #16). Aja, though, is (personally) one of my favorite albums from the late 70s. 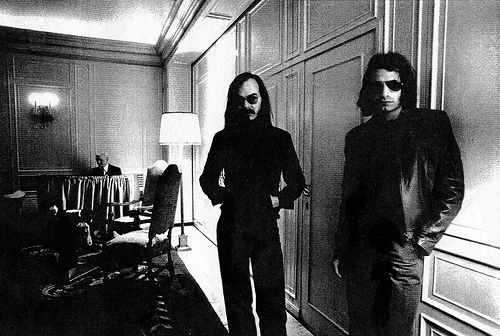 Steely Dan hit their creative peak between 1974-1977, when their best albums were produced. With the obvious professed love of Steely Dan, I am not afraid to admit being a “Dan fan”. Guess I was over influenced by some music connoseiurs I know – great people (they introduced me to, amongst other things, Aquarium Drunkard) – who are not “Dan fans”. Thank you for realigning my perspective on Steely Dan. I love Steely Dan, and I love 90% of the music posted here. I’d put up Wilco as our Steely Dan. Especially with Sky Blue Sky. Rock music played a mix of country, jazz and rock musicians and great, pointed lyrics. in a weird way, Karate is like a raw simplified version of Steely Dan. RE: gaucho outtakes. label wasnt happy, had to remove them. Oddly enough, I think it could have been Axl Rose. Chinese democracy tries to synthesize a lot of musical elements in a traditional rock and certainly he spends lots of time in the studio with expensive studio musicians and it’s not cool to like him. But then nobody really likes the album that much and I don’t hear a Peg on that album or even a Fez. Vote two is for Beck, because he fits many of the above requirements, he understand irony as well… but is it still cool to like Beck? Love the interview about the cab driver and the “stupidest lyric” in New York City. “Is there gas in the car? Yes there’s gas in the car.” LOL. Becker and Fagan are some interesting dudes. They sure knew how to pick players and get good performances from them. So: Beck, Wilco, Beta Band, Axl Rose? (mentioned above). I don’t know. I would say nobody is today’s Dan. Nobody appreciates both the groove and the complications that the Dan embrace. I mean, you could throw Black Dice or Battles or RJD2 into the equation. Couldn’t you? Check out Steely Dan’s 1976 album The Royal Scam. The whole album is phenomenal, but the best tracks are two immensely underappreciated ones; The Caves of Altamira and The Fez. Funky stuff. this has really made my day…Thankyou! Ive not found anyone that I can compare adequately with Steely Dan. The last Gonzales album (Soft Power) had a couple of early dan sounding tracks but can’t be considered a true contender in the 00s comparison. Don’t feel like i’m desparate to find a comparison really…Steely Dan’s albums have amazing longevity… well, i’m not bored yet anyway and i’ve been listening since my parents AJA to me in the womb! It’s a complicated question, the who-is-the-Dan-of the new century. Let’s ask Fagen and Becker. No? I must confess I’ve posed it to myself on more than one occasion. It depends on how philosopcal one wants to get I guess. Are we talking about a one to one musical comparison or are we talking about an apprach to recording and prehaps music in general that is uniquley Steely Dan? Or the whole package? I’ve not heard anyone yet who has really figured it out. Not to say I haven’t been waiting. I will say this. There was a few moments in Early 2000 that I believed there might be a contender. A French band (gasp i know) by the name of Phoenix on their debut record United managed a very diamond edged, studio honed, heady concoction of sophisticated rowdiness that, right of the gate with the ‘Schools Rules” had me counting down to ecstasy if you know what I’m saying. I highly recommend it. Criminally overlooked record. Subsequent offerings have been wonderfully enjoyable and still sprinkled with Steely moments — but nothing that would allow me to confer upon them the title Dan mantle takers. Prefer the old stuff–Countdown to Ecstasy, The Royal Scam, Katy Lied, Pretzel Logic, Can’t Buy a Thrill. Back when they rocked it. I lost it at Aja. Probably cause I heard it like a million times on the classic rock station on my youth. I disagree with others above re: Two against Nature. That was a crime against nature. The Caves of Altamira is amazing. about 1997 someone gave me a cassette of what is now commonly labeled “Android Warehouse”. it is IMHO one of the best outtake tapes ever. so raw. “the caves”on there is amazing. it’s like hearing the newley released “sugar mountain” neil young release. listening to something at it’s genesis. check it out. I don’t want to pee on anyone’s parade but there is no 00 Dan equivalent, can never be & will never be! Why do I say this so rigidly, well The Dan were/are quite musically unique. Why re-make something musically that’d be a complete waste of time, Suede tried and failed miserably (although they were ace) to re-make ziggy/bowie/the thin white duke and the nearest a group has ever gotten to kind of sounding like The Dan were Samuel Purdie back in the 90’s but they were a one off from a group of guys horsing around, check them out on Youtube. One could cite The Doobie Brothers but I hate to say it I can’t see any band touch on The Dan’s style and musical panache, I think it best that we leave it to Becker & Fagen to play it out. Never heard such crying about not being able to admit you like ” The Dan’. Guess your afraid u might have to explain the term to your parents. First saw them perform at the Coliseum (Memphis) in 72 or 73. I never left, haven’t and won’t. Got the same feeling when “Boston” opened for “Foghat”, got the same with “Van Halen”, all three raised the hair on my head. I knew I was hearing some new, powerful and exquisite. Oh by the way I had never heard of any of them!